Where did the water on Earth come from? The early Earth was a very hot, very dry place, but over time it accumulated water to form our massive oceans and lakes. For a long time, astronomers have suggested that our water originated with the “icy-snowballs” of the solar system – the comets. Unlike asteroids, comets are mostly water. And comets are plentiful (there are probably billions of them just outside of our solar system). Over long periods of geological time, enough comets could have impacted the earth to deliver the water found in our oceans. However, like any scientific idea, scientists needed a way to test this hypothesis. While observations of comets have occurred in the past (such as ISON and comet Hartley-2), the visit of Rosetta to Comet 67-P provides us with our first chance to view a comet up close, and to sample the chemicals and compounds that it is made of. In other words, Rosetta is the experiment to test the hypothesis that the water on Earth originated with comets. Rosetta is going to do this by looking for the presence of a special type of hydrogen atom called deuterium. 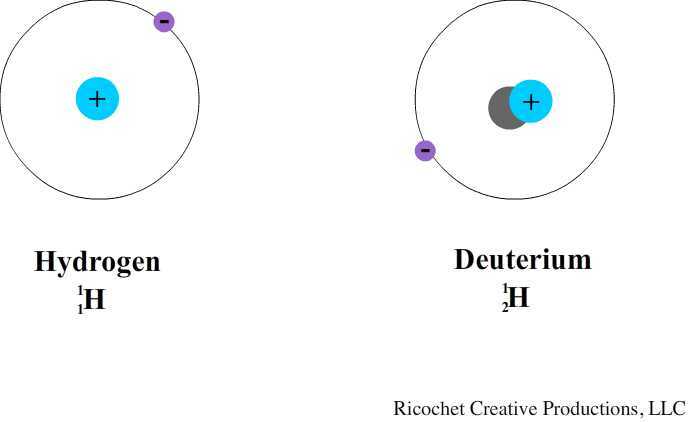 Deuterium is commonly called “heavy hydrogen” because it is an isotope of hydrogen that has a neutron. This gives the hydrogen atom an atomic mass of 2, rather than the mass of 1 found in most hydrogen atoms. Deuterium is not radioactive, and is very stable, so it does not decay over time like other isotopes. (click here for a review of isotopes). Dueterium is also relatively rare, hydrogen-1 is much more plentiful in our universe. Therefore, it is possible to measure the ration of deuterium to hydrogen to obtain something called the D/H ratio. When ROSINA performed these measurements, it found that the D/H ratio of the water on Comet 67-P was significantly different from other D/H ratios in the solar system, and even from other comets, such as Hartley-2. Although these results are relatively new, the findings have already led scientists to question their earlier hypotheses on comets and the origin of water on Earth. Does this conclusively mean that the water in the world’s oceans did not originate with comets? Not really. In fact, a previous study of comet Hartley-2 indicated that the water on that comet matched the D/H ratio found on Earth. Both Hartley-2 and Comet 67P belong to a class commonly called a Kuiper-belt comet, but in reality, and as suggested by the authors of this study, we really do not know where most comets originate. What it does mean is that the type of water found on Comet 67P does not match the type of water found in our oceans. 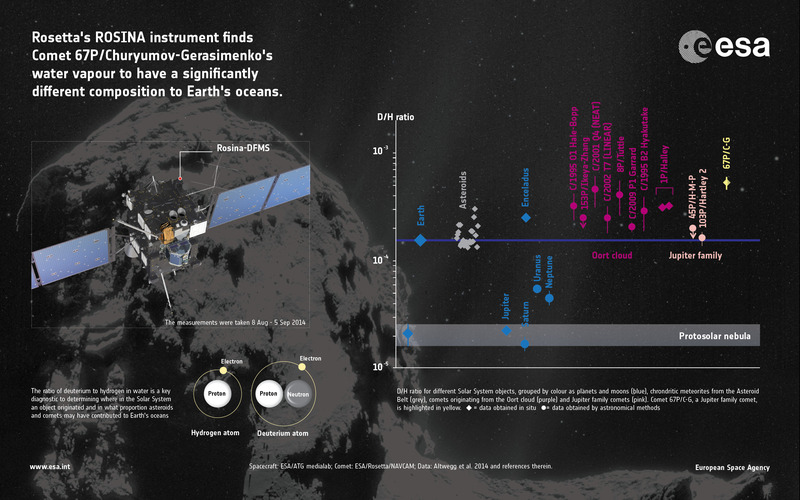 It may be that Comet 67P belongs to a group of comets that was not involved in seeding our oceans, but that does not necessarily exclude all comets. How will we test this? More missions to more comets and more observations of near-Earth comets (such as ISON). However, the other possibility is that the water on Comet 67P is representative of the water generally found in comets and therefore that the Earth’s oceans were not primarily formed by collisions with comets. If this is the case, then scientists are going to take a closer look at the asteroids. While asteroids are generally not known to have high water contents (see the ESA chart above), the water they do have more closely matches the D/H ratio of the Earth’s oceans. It is also possible that asteroids earlier in the life of our solar system possessed more water. If asteroids are now a candidate, then one thing you will probably hear more of in the near future is the need for a mission to a near-Earth asteroid – not to find minerals, but to take a closer look at its water content. Either way, we are going to have to rewrite the textbooks, and that is never a bad thing for science.